Laurie Boyle Crompton gets her Fangirl on! There’s something extra special about announcing an author’s debut sale; I always want to pull out the confetti and party hats, and toss up some streamers. Today I am doing all of that and more for our very own Laurie Boyle Crompton, whose debut YA novel has just sold—in a two-book deal, no less!—to Aubrey Poole at Sourcebooks Fire. Laurie Boyle Crompton’s debut FANGIRL, about a comic-obsessed girl who gets into an online war after her first major crush dumps her supervillain-style, to Aubrey Poole at Sourcebooks Fire, in a two-book deal, by Ammi-Joan Paquette at Erin Murphy Literary Agency (World English). Laurie is someone we are definitely going to be hearing great things from going forward. Go, Laurie! And now there is still more excitement in store for the very busy Tara: her second picture book has just sold, again to Alyson Heller at Aladdin/Simon & Schuster, and will be published in summer 2014. This latest zany offering is entitled I THOUGHT THIS WAS A BEAR BOOK, and recounts the misadventures of an alien who crash-lands in the wrong library book—ending up in a bear-infested forest when all he wants is to return to his home planet. What happens next? Tune in summer 2014 to find out! Another Star for STARS from Booklist. 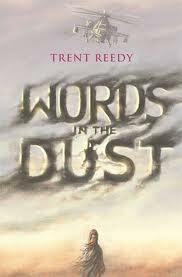 Trent Reedy has been keeping himself very busy lately: recently returned from a ten-day UK book tour to promote the British version of WORDS IN THE DUST, he has been working very hard to put the finishing touches on his second book, the middle-grade adventure STEALING AIR, about three unlikely friends in small-town Iowa who decide to build a real-life flying machine. STEALING AIR will be out from Arthur A. Levine Books in fall 2012. With all of that going on, you might be surprised to know that this isn’t all Trent Reedy is up to: Rather, he has turned his writing hand to something a little bit different from his first two middle-grade novels. Trent’s third book, which was bought by Cheryl Klein at Arthur A. Levine Books, is a contemporary YA novel entitled IF YOU’RE READING THIS. It follows the story of a teen boy whose father has died years before in Afghanistan, who comes upon a trove of correspondence which his father left to be read in the event of his death. One bright summer day, Sophie chose a squash at the farmers market. It was just the right size to rock in her arms. Sophie’s adventures are many and varied, and I’m sorry to say that you’ll have to wait a few years to read about them yourself—but trust me, it will be worth the wait! SOPHIE’S SQUASH was sold to Anne Schwartz at Schwartz & Wade (Random House), and I could not be more delighted. Congratulations, Pat! Now that we're in the crisp of fall, here are some books to help you (and your favorite kids) watch the skies! Stars by Mary Lyn Ray, a gorgeous picture book about stars appearing everywhere we look, published by Beach Lane Books. Light Up the Night by Jean Reidy, a lovely picture book about our place in the universe, published by Disney/Hyperion.